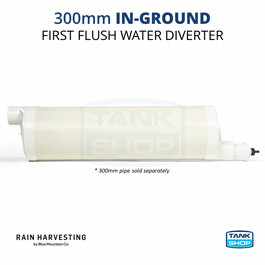 In-Ground First Flush Water Diverters are buried out of sight, and normally come with larger chambers for higher “first flush” water diversion requirements. In-Ground diverters also allow a ‘wet’ system to be converted into a ‘dry’ system, prevent rainwater left in your pipes becoming stagnant and entering your tank. Note: Water diverted should be a minimum of 20 litres per 100 square metres of roof area (or 0.2L per m2).